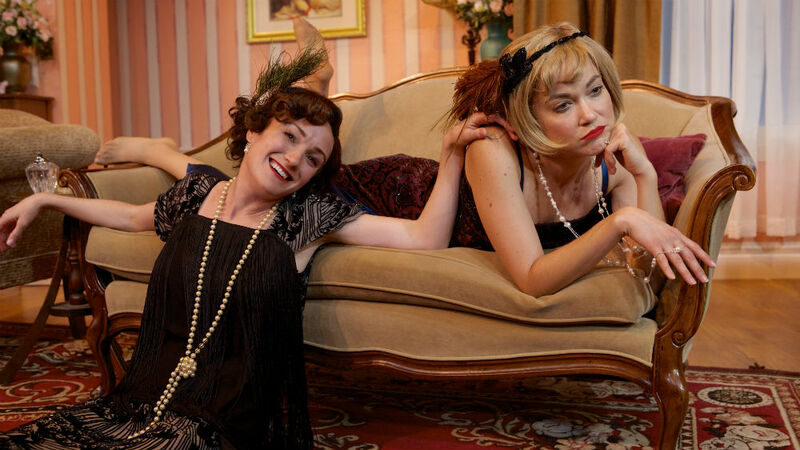 Joanna Strapp and Summer Spiro in “Fallen Angels” at North Coast Reperatory Theatre. If spending an evening with witty Brits, of the fizzy, frothy and frivolous sort, Noël Coward’s your man, and “Fallen Angels” is your current play of choice. This is early Coward, written in 1925, when he was a callow 26 years old. He would refine his urbanity and his characters’ inanity over time, but this is a good starter, if you don’t mind a bit of protraction in getting from the premise to the dénouement. Two veddy upper crust London couples, best of friends, living on different floors in the same building, are dismayed by the diminishment of ardor in their marriages (well, at least the wives are). The Seven Year Itch seems to have arrived early. As the men go off for a sporting weekend of golf, the desultory, well-dressed women while away their hours in talk of clothes and food and other superficialities. But a little lagniappe has entered their lives. They’ve both just received postcards from one Maurice DuClos, who was a lover of each of them in their premarital glory days. Now, the question is, should they rendezvous with him, knowing full-well what the outcome and repercussions will be. Maurice says he’s arriving that very night. They plot, they plan, they equivocate, they dress up, they argue and, giddy with the thrill of it all, drink themselves into a near-stupor. Havoc ensues, when the husbands, having also had a “row,” arrive home early. In spiteful vengeance, each woman spills the adulterous beans to the other one’s husband. And then, Maurice shows up at the door. How this all gets worked out is the stuff of a sparkling, bouncy production at North Coast Repertory Theatre. The play feels like a trifle, and at nearly 2½ hours, more than the trifling thing is worth. But it’s getting a lovely outing, under the expert baton of director Rosina Reynolds. She’s cast a delectable duo at the center: the caustic Julia of Joanna Strapp and the ditsily adorable Jane of Summer Spiro. As their mates, wide-eyed Jason Maddy and bumbling Thomas Miller are spot-on. And bustling among them, as the condescending, know-it-all maid, is a very funny Jacquelyn Ritz. Richard Baird looks appealing as the seductive Maurice. But oh, Mon Dieu!, those French accents… sacré bleu! The costumes (by wizardly Alina Bokovikova) are superb; those frocks and gowns are knockouts. Marty Burnett’s set is as pink and white and froufrou as the dialogue. Yes, there are some ‘issues’ here, about the nature of friendship and marriage, and the sexual double standard. But these women are positively Hamletian in their vacillation. As they persist in dithering, you kind of just wish they’d do something (kill their uncle, maybe?) and get it over with. Plenty of laughs to be had, and bucketfuls of effervescent discourse. So, drink up, if that’s your cup of bubbly. Performances are Thursday-Saturday at 8 p.m.; Saturday and Sunday at 2 p.m.; Sunday at 7 p.m.